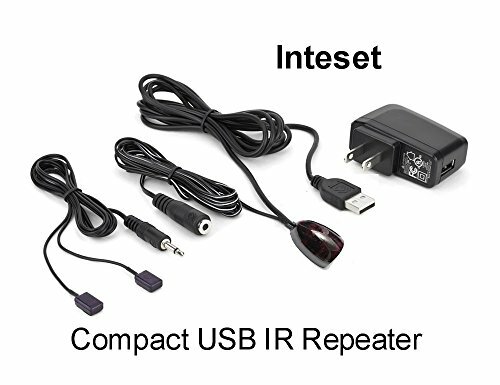 The Inteset USB IR repeater kit allows you to use an existing remote control to operate up to four AV components located in the rear of the room, in a cabinet, an equipment closet, or anywhere else. The Inteset IR distribution technology allows you to conceal all of your bulky entertainment equipment, like your cable box, satellite receiver, stereo, amplifier, Blu Ray player, and more without losing the ability to control it with your remote. The repeater kit is wide band, which means it will work with the most IR devices. You can power the Inteset USB Repeater with the USB port on your TV, giving you a clean look and an easy install. If your TV doesn't have a USB port, simply use the included 5v. adapter and plug it into any 110v. household outlet. This compact Inteset IR Repeater is perfect for a simple installation in which you are only hiding away one or two devices. It consists of 2 emitters, a receiver, and a USB power cable. The receiver is a small, easy to hide device that you can mount on or near your TV. It must be in the line-of-sight to wherever you will be using your remote control. The receiver picks up your remote's IR signal and transfers it over a small cable to the emitter. The emitter must be placed directly over the IR sensor on the device you wish to control. The USB power cable either plugs into the USB port on your TV, or you can plug it into the included 5v. adapter to power the Inteset USB IR Repeater. If you need to control more than 2 devices you can use a 4 head emitter cable which is available from Inteset and sold on Amazon. The convenient 3.5mm jack allows you to swap out emitter cables quickly. Don't be fooled by the products supplied by others that do not have the power adapter or the ability to change the number of emitters. Our system gives you the flexibility that you need if things change. Our warranty protects you against any problems. If you have any questions or issues contact us at: universalremotes.net. An ideal solution to conceal A/V components behind closed doors. Fast US Based Service. One Year Warranty. Many years of experience. Infrared Resources Single device USB powered 30~60kHz IR Remote Extender Repeater for the majority of A/V (IR) devices including U-Verse,SA/Cisco Explorer,DTV,Bell,Foxtel STB,A/V Receivers etc.